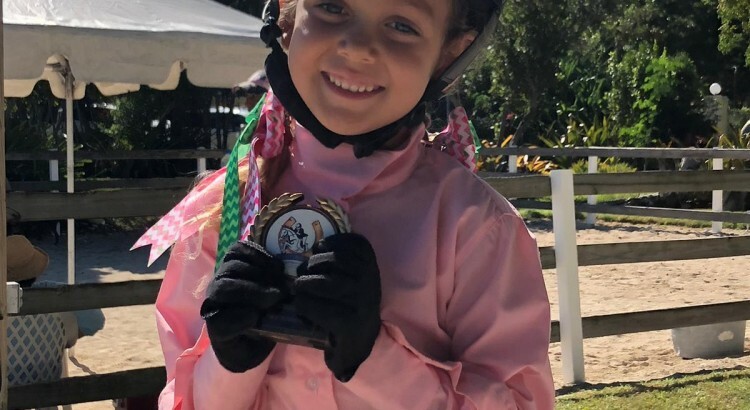 The second horse show of the Equestrian Bahamas 2018-2019 show season took place this past weekend at Camperdown Equestrian Centre. The show was a two-day event: Saturday’s classes featured the crowd-pleasing speed jumping events, while on Sunday the focus was on Equitation classes which emphasize style and technique. Riders competed at all levels, from Future Champions in Lead Line right up to the 3-foot level. The show was judged by Mr. Robert Robold, President of the East Coast Hunter-Jumper Association, owner of North Hammock Stables in Merritt Island, Florida, and USEF R-rated judge in Hunters, Jumpers and Equitation. At the close of the show Judge Robold gave two special awards: Sara Gottberg and Amalia Good were co-winners of the High Point Rider award, given to the rider or riders earning the most points in their division. Mollie McDermott was the winner of the Tibri Sportsmanship Award – a surprising choice to some as Mollie did not compete in the show! Congratulations to Mollie, Sara, Amalia, and to all riders and trainers on goals achieved, lessons learned, and ribbons won! A great time was had by all. The next show of the Equestrian Bahamas competition calendar will be held on December 8 and 9, 2018, at Mariposa Stables in western New Providence. Admission is free and the public is invited to attend!